What style is your client's space? What style is your client’s space? Does your client have a formal living room with big, ornate leather furniture, muted-color walls and accessories (and many leather-bound books)? You’ll probably want to go with something more traditional – images where everyone is looking at the camera and layouts that are symmetrical. Funky colors and playful accessories throughout the room? Spontaneous, candid photos and asymmetric gallery layouts will be right at home in this space! How will their gallery wall interact with existing furniture or artwork? Be sure to consider how your client’s new wall art gallery will work alongside the furniture they already have in their space. Balance the size and design of the galleries to complement the furniture or any architectural features in the space. As a rule of thumb, always try to hang artwork at, or as close to, eye-level as possible. How will their artwork interact with the existing colors in their room? Try contrasting bold wall colors with muted or black and white photos to make them stand out. Muted wall colors in a playful room just beg for bold splashes of color, images with interesting compositions and layouts that show off different subject sizes. Don’t be afraid to “break the grid” and work with asymmetric and funky layouts! How much wall space does your client have? Don’t try to sell the biggest piece for your client’s space, sell the right piece for their space. Sometimes this will mean filling a space from side to side, and top to bottom. Sometimes a collection of smaller images is perfect. If they have a large, white, blank, boring wall to fill, go nuts and fill it with a mix of large and small images. Symmetrical layouts that fill a space are an easy way to make a bold statement on an otherwise boring wall. If you only have a small amount of space to work with, or other busy elements nearby, something smaller and understated will be the way to go. Don't try to sell the biggest piece for your client's space, sell the right piece for their space. Consider Viewing Distance: How far away will your clients be when looking at their gallery wall? If your clients have a large room and you’re trying to fill a space on the far wall, large pieces will work well there. In a smaller room, say a bathroom or hallway, where you’ll be much closer to the piece when viewing it, you’ll want to go with much smaller images. Think of it as sitting too close to the IMAX screen in the theater, you don’t want to have to physically move your head in order to see the entire image. 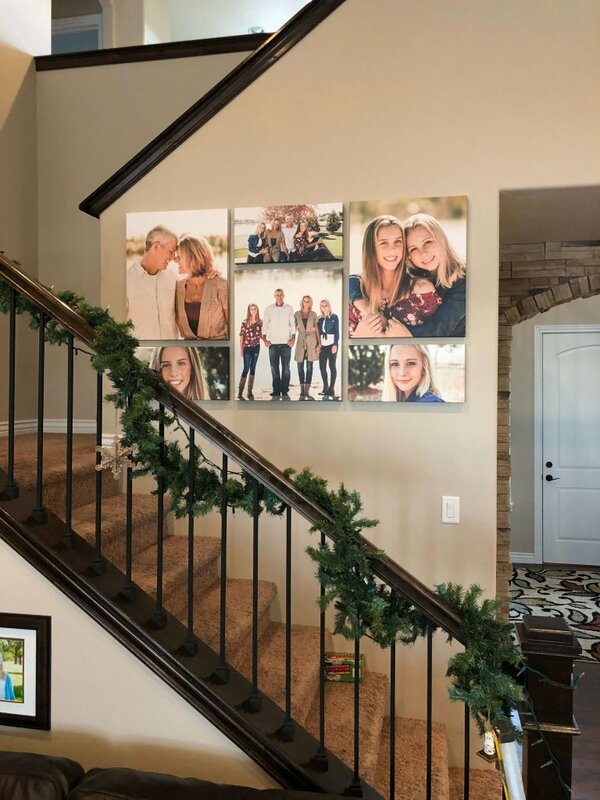 Using wall gallery design software like Swift Galleries will help in choosing that perfect location for your gallery wall because you’ll be able to see exactly what the artwork will look like on the clients’ wall, at exactly the right size.